Regional and statewide programming and agency capital planning (a.k.a. budgeting) involve identifying and prioritizing ITS projects. The result is funded projects. These processes are shown in Figure 36. Using a regional ITS architecture to define an ITS project links the objectives and needs of the region identified in the architecture with the ITS deployed in the field. In a region, ITS projects are deployed by many organizations including the State Department of Transportation, transit agencies and many local agencies and authorities. If projects of the various organizations are defined from the same reference point, the regional ITS architecture, then coordination begins in the initial planning and funding phase. ITS projects in a region may be funded by a variety of sources. ITS projects that are funded with federal funds are programmed by Metropolitan Planning Organizations (MPOs) and State DOTs with input from transportation agencies in the region. All organizations in a region, whether they use federal funds to deploy ITS or not, perform short term planning via their capital planning (i.e. budgeting) process. The Transportation Improvement Program (TIP) is a staged, multiyear, intermodal program of transportation projects that is consistent with the long range transportation plan for a metropolitan area. At the statewide level there is a corresponding Statewide TIP (STIP) that is consistent with the long range statewide transportation plan. The TIP/STIP assigns federal funding to a prioritized list of specific projects to be constructed over a several-year period (usually three to six years) after the programs approval. As discussed in Section 7.1, a regional ITS architecture can be adopted as part of or by reference in the Long Range Transportation Plan (LRTP). If this is the case, ITS projects should flow from the LRTP into the TIP in the same fashion as capital projects. Whether the regional ITS architecture is incorporated into the LRTP or not, the architecture can be used to define ITS projects that are submitted for federal funding. In some regions, ITS projects in the TIP/STIP are not defined in much detail. Sometimes merely a placeholder for ITS projects is included. A benefit to using a regional architecture to define ITS projects is that the projects can be specified in greater detail thereby allowing more realistic estimates of the costs, benefits, schedule, etc. The process for defining projects differs across the nation. In many regions, project sponsors (i.e. DOT, transit agencies, local agencies, etc.) submit projects to the planning agency for potential funding. Project sponsors should base the projects submitted on the needs of the region. As ITS needs were defined in the regional ITS architecture, the architecture can be used to define ITS projects as described below. When project sponsors submit ITS projects for programming, some planning agencies require that the sponsors submit architecture-related information about the project. Some agencies merely require yes/no questions to be answered regarding the project's inclusion in the regional architecture while others request more detailed information such as the elements, services, and/or interfaces of the architecture to be deployed in the project. If an ITS project is submitted which is not included in or is not consistent with the regional architecture, a justification for the project should be required. If it is justified, the impacted stakeholders support the project, and the project is funded, the regional architecture should be revised to incorporate the project. In the TIP/STIP, projects that contain ITS elements should be designated as ITS projects so that projects sponsors are aware of the associated requirements from the FHWA/FTA Rule/Policy. The Metropolitan Transportation Commission identifies ITS projects in their TIP (within their TIP software system, WEB FMS) as shown in Figure 37. 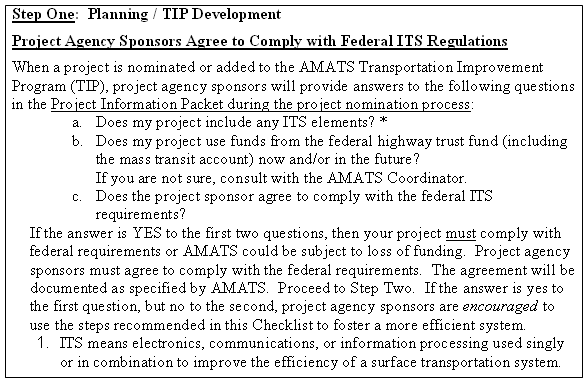 The Anchorage Metropolitan Area Transportation Solutions (AMATS) has a checklist for project sponsors and the section on programming is shown in Figure 38. The programming process involves prioritizing projects and using federal funds to fund the top priority projects. Each region has a process for prioritizing projects. The regional ITS architecture can be useful in this process as it reflects the vision for ITS in the region so a factor in prioritization should be how well a project fits within the regional architecture. In some regions, projects (of some categories) are allotted additional points if they include elements or interfaces of the architecture. For example, the Rhode Island State Planning Commission assigns points to projects that enhance their ITS network based on the scale shown in Figure 39. A regional architecture may better support programming if the project sequencing and related architecture elements are updated on a maintenance schedule that supports the TIP cycle. The architecture should be updated prior to a project submittal request so that it can be used by project sponsors to identify projects. If thorough updates to the architecture are to correspond to LRTP updates, less major revisions to the architecture can be made to correspond to the TIP cycle. All agencies including State DOTS, transit agencies, local municipalities, etc. use a budgeting process to allocate funds to projects. A regional ITS architecture should include the existing and planned elements of all stakeholders and how they are or will be interfaced with other ITS elements in the region. Therefore, all organizations can use the architecture to define ITS projects, as defined below, and feed them into their budgeting process. Many ITS improvements are implemented as part of larger capital improvement projects. As traditional capital projects are defined and programmed, it is important to identify the associated opportunities for efficient ITS implementation. The regional ITS architecture is a record of the ITS implementation planned by each agency that can be used to identify these opportunities. Some agencies are considering policies to review each capital project to determine if ITS measures should be included before the project moves forward. Many agencies do this type of review as good practice, but these opportunities would be identified more consistently and "carry more weight" if this check was formally defined and required by an established policy. For example, Georgia DOT is incorporating such reviews to their Plan Development Process that sets the procedures and steps for administering Federal-Aid projects from project identification through construction award. A regional ITS architecture includes a sequence of projects as described in Section 6. Projects from the architecture should feed into the programming and/or capital planning processes. As the projects defined in a regional ITS architecture are sequenced and have defined characteristics (See Section 6 on Project Sequencing for information on defining projects), just as in an ITS strategic plan, organizations can use the architecture to define ITS projects to be submitted for funding from any source. To obtain funding, a project sponsor must define a proposed ITS project. The information contained in a regional ITS architecture can be used to define projects with more detail in order to better scope them and establish project budget requirements. Review the list of stakeholders to identify those that should be involved with the project and those that are or may be impacted. Use the stakeholder roles and responsibilities defined in the operational concept to clearly define the roles and responsibilities of the stakeholders involved in the project. Review the relevant service(s) (i.e. market package(s)) to identify elements potentially directly or indirectly associated with the project and recognizing potential partners to share development costs, material and/or labor, facilities, etc. Use the defined interfaces between ITS elements to identify current and future integration opportunities. Utilize the sequence of projects to gain insight into the timelines and dependencies of a project with others including identifying opportunities to coordinate with capital projects. Apply the project description of the project sequencing including costs and benefits, technical feasibility, potential institutional issues and readiness to clearly define the project. Gain a thorough understanding of the elements and interfaces included in a project to more accurately estimate project budgets. The most challenging issue to be addressed in the integration of a regional ITS architecture into the project planning process is the fact that there is more than one planning process in a region. Coordination is critical between the State Department of Transportation, MPO(s), and all organizations in their respective programs, budgets, and/or capital plans. Another critical issue is coordination of Federally and non-Federally funded projects in a region. In many regions, non-Federally funded projects are generally not included in the TIP/STIP. A regional ITS architecture should contain all ITS elements and projects within the scope of the regional ITS architecture irrespective of funding source. As the ITS Architecture enables understanding and coordination of all ITS related projects for all stakeholders in the region, stakeholders can benefit from using an ITS Architecture to plan, program, and deploy all ITS projects not just those that are Federal funded and therefore, must meet the Rule/Policy requirements.. Agencies that sponsor integration projects that are identified in the regional ITS architecture may face several hurdles. Involvement by multiple agencies may add perceived risk to the project and the benefits from the project may be more regional in nature and difficult to quantify as hard savings for a particular agency. The region can offset these hurdles by promoting integration projects to encourage support from individual agency project sponsors. For example, the Maricopa County Area Governments (MAG) MPO has a documented process for ITS project prioritization that favors ITS integration projects that are identified in the ITS strategic plan and support multiple agencies. A prioritization process like this that favors integration projects with regional benefits can help to offset the hurdles faced by individual agency project sponsors. To ensure ITS is deployed based on the regional vision contained in a regional ITS architecture, a process for local and regional planning and funding of projects based on the regional ITS architecture should be established. Policies and procedures to incorporate ITS projects in the programming/budgeting processes could be set or a group of various ITS stakeholders could be assigned the responsibility for monitoring the deployment of ITS in the region. The processes for deploying projects differs in every region so the process to best support ITS deployment based on the architecture should be adapted to the region's processes. The "Initial Project Proposal" and "Project Scoping Report" are NYSDOT documents, and the LRP and TIP are local MPO documents. The Project Scoping Report is prepared for all funded projects, irrespective of the source of funds. Also, in any case, the project scoping report will describe ITS elements with interfaces and information flow interfaces that are inherited from the regional ITS architecture. Although not shown in the figure, planning, programming, and project scoping activities also provide feedback to the ITS architecture since the evolving plans, programs, and project definitions should be reflected in future architecture maintenance activities.